Imagine an art gallery full of trunks, suitcases and crates. There’s a damaged FedEx package, a piece of luggage that has been inspected by the TSA and “emotional baggage” from a breakup. This Friday, Jan. 26, the Weatherspoon Art Museum’s Bob & Lissa Shelley McDowell Gallery will be transformed into a baggage claim of sorts as it welcomes the Orlando Museum of Art’s highly anticipated exhibition to Greensboro. 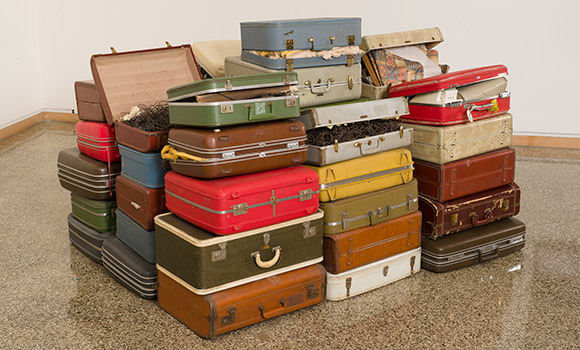 “Baggage Claims” presents its featured artworks through the lens of global mobility, and each work suggests multiple readings. On the one hand, each tells the story of individuals and their journeys. Simultaneously, they refer to the politics and policies that create and shape those individuals’ experiences. Friday’s reception begins at 6:30 p.m. at the museum and is free and open to the pubic. The exhibition will be on display through April 22, and additional events related to the themes of the exhibition will be held throughout the semester. Admission to the museum and parking are free. For more information, visit weatherspoon.uncg.edu.